Following on from yesterday’s post, I thought I’d share some of what I turned up online about the reaction to the carrier bag fee, because it is a mix of amusing and gobsmacking. Can't believe the chaos outside. Grown men on their knees, crying in the rain, staring at a plastic bag. Complete turmoil and confusion. REMEMBER: When faced with #plasticbagchaos – STOP. DROP. ROLL. 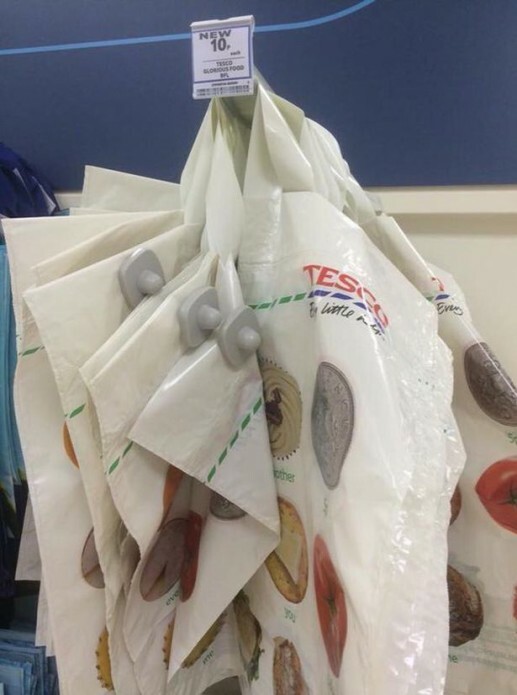 5p for #plasticbags? Suddenly the cupboard full of them in my kitchen has just made me a millionaire. Yes, really. The Sun reports that Asda customer Delroy Hilton felt like he was “treated like a dog” by staff who allegedly tried to force him to pay for his plastic carrier bags. He claimed that while trying to carry his shopping to his car in a basket from the shop, a worker emptied his goods onto the floor. He paid at a self-service checkout at the store in Sheldon, Birmingham, but did not want to pay for a bag. After the incident, he was asked to leave, and the next day was told that he was banned for using foul language and being abusive towards staff. This post makes it look like I’m a Telegraph reader, but in truth I don’t really read any of the national newspapers. I just end up clicking from one story to another to another, and today somehow I started on that site. It’s the local news I keep up with – hence Glossop Events. But should consumers alone be punished? It was the supermarkets that got us hooked on plastic bags in the first place. Not so long ago, all bags were “bags for life”. My grandfather lugged the same straw basket to and from the local Safeway every day for 20 years; and when that fell apart he bought another one, just the same. He knew the capacity of his basket by heart, the way a cat knows its fences. If he couldn’t fit it into the basket, he didn’t buy it. This made him – his entire frugal generation, in fact – irksome to supermarkets. If these stores were to persuade customers to buy impulsively, to succumb to the lure of the two-for-one, they needed to make it easier for them to carry the extra booty home. Giving away free, single-use plastic bags was central to the success of the supermarkets. It helped train a generation of shoppers in bad habits, and ushered in a new era of convenience, greed and waste. Supermarket profits have come at a heavy cost to the planet. Isn’t it only fair that they’re the ones who should pay the price? SJ don’t you have the cloth recycle bags you can take to the store like we do? Also, do the stores not provide a choice of paper or plastic bags? If the answer is no to both of these and the only option is the store plastic bags, then I think I would come up with my own recycle type bags and take to the store. Yep, I’ve been using cloth bags for years. Many people use reusable plastic ones (heavier duty than the thin normal ones). I use cloth so I can wash them in the clothes washer, because bags collect germs massively – read a study on it awhile back. This was just a silly lighthearted post. Oh, and no – paper grocery bags aren’t available here at all. Little paper bags (half or less the size of the quintessential lunch sack), with handles, are quite common from market stalls and certain small shops, but not the big ones for groceries. What is 9 * 5?